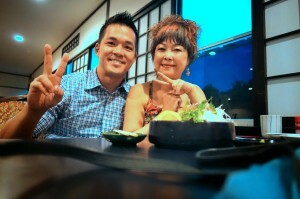 :: Dinner with Mom :: For her birthday this year, Mom… - Dreams are what you wake up from. For her birthday this year, Mom asked for a simple and quiet catch up. “Just you and me, that would be nice,” she suggested. Later than expected. Mom had the entire evening free, fortunately. After I made my greetings to Grandma, I drove her over to a nearby Japanese eatery. As I was prepared to give a nice treat on her birthday anyway. Sashimi, with a Tori Tonkatsu as well as a Nabe Dinner set. Job, the people that revolved around my life, financial matters, and more. Conversation topics, two hours have passed. From the phone memories to the SD card memory. So that she would be able to get the hang of it. With every birthday passed, both Mom and myself grow older. Such a sweet post. Happy birthday to her! Many happy returns of the day!